NEWINGTON — Newington boys volleyball head coach Curt Burns was worried about how his team was going to respond coming off a tough loss five-set loss the night before. It turns out, there wasn’t much to be worried about as the Indians beat Cheshire in straight sets 25-21, 25-19, 25-15 Tuesday night. 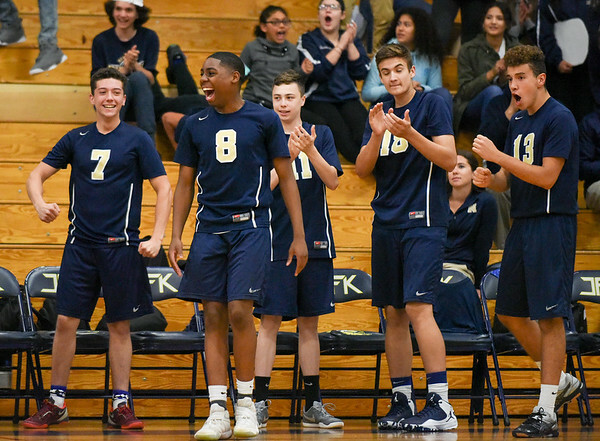 Dan Clourtier led Newington with 30 assists; Collin Liedke had 15 digs and three aces; Leonel Caceres finished with 11 kills; and L ouis Egbuna had 10 kills. Goodwin Tech 5, Grasso Tech 0: A sign of a good baseball team is getting wins against an opponent it should beat. The Gladiators did just that. Ryan Johnson earned the win for Goodwin Tech, while teammate Tommy High had a solid day at the plate, collecting three hits. Wolcott Tech 15, Goodwin Tech 11:The Gladiators took the lead early, they just couldn’t hold on to it. “We came out from the very beginning and hit the ball hard,” Goodwin Tech head coach Paul Soucy said. “We took a 3-0 lead [after the first inning] and then fought back to make it a 10-8 game in the fifth. But it was a seven-run third for Grasso Tech that proved to be the real different maker. Despite the outcome, the Gladiators got some quality atbats along the way. Paola Barbosa had three hits, including a three-run home run in the seventh and had four RBI in the game. Her teammate, Teresa Lopez, had two hits and two RBI. Newington 202, Glastonbury 203, Manchester 244: The Indians continue their successful season, improving their record to 5-1. There were three medalist on the afternoon, two of which were from Newington. Chloe Bilodeau and Taylor Kelly each shot a 47, alongside Glastonbury ’s Brianna Kearney. The Indians were also lead by Jessica Pierzchalski who shot a48, Leah Pofeldt who shot a 60 and Maddie Massarro-Cook (62). Plainville 221, New Britain 227: The Blue Devils improve their record to 3-2. Although New Britain’s Tim Carrier was the medalist on the afternoon, shooting a 46, Plainville was still able to seal the win. Leading the Blue Devils was Zach Bartolini (53), Christian Zamudio (56), Jacob Deschaine (57) and Alan Nilson (55). Goodwin Tech 231, Grasso Tech 231:It was a neck-and-neck battle that ultimately saw no winner. Hunter Brazee was the medalist. The Eagle shot a 52 on the par-35 course. Jackson Collin (53), Josh Donghy (53), Brandon Ketkeorsmy (61) and Farrell Leardi (64) were the four best scorers for Goodwin Tech. Berlin 91, Platt 43: The Redcoats didn’t have much competition. Patty Mroczkowski won high and long jumps, while Lexi Kavarsky took both the 100 and 200 hurdles. The 4x100 and 4x800 relay teams also came out with wins as Berlin moved to 4-1 on the season. Berlin 98, Platt 52: The Redcoat had quite the successful day on the track. Alex Halkias was a triple winner, claiming first place in the 100 meter dash ,200 meters and the long jump. Matt Bacon was a double winner in the 110 meter hurdles and the 300 meter hurdles. Mike Tarzych was also a double winner, claiming the 1,600 and the 3,200. Posted in New Britain Herald, Berlin, Goodwin Tech, New Britain, Newington, Plainville, Southington on Tuesday, 1 May 2018 21:24. Updated: Wednesday, 2 May 2018 16:58.